What’s unusual about this recipe is that the cupcakes turn out great! I was given this recipe by another mom about five years ago and I never asked why you pour the water in separately when you mix the wet and dry ingredients. Of course, I keep doing it anyway, just in case that’s why they turn out well. I’ve changed the recipe quite a bit over the years. The cupcakes had a lot more sugar and a lot less pumpkin originally – but they are plenty sweet now with 2 whole cups of sugar. 3. Stir together the sugar and oil. 4. Stir in the eggs and pumpkin. 5. Combine the dry ingredients in a separate bowl. 6. Mix the dry ingredients and water into the wet mixture, alternating. Don’t overmix. 7. Spoon the batter into the muffin tins. 8. Bake for 20 to 30 minutes, until a toothpick in the center comes out clean. 9. Let stand 10 minutes. 10. Remove from the pans and cool. Frost with cream cheese frosting: Cream together one 8 oz. block of cream cheese and ½ cup of softened butter. Blend in 1 t. of vanilla extract. Then slowly mix in 2 cups of powdered sugar. I don’t use food coloring, so I don’t color the frosting orange (or black!) – I just stick a plastic Halloween doodad on top instead. 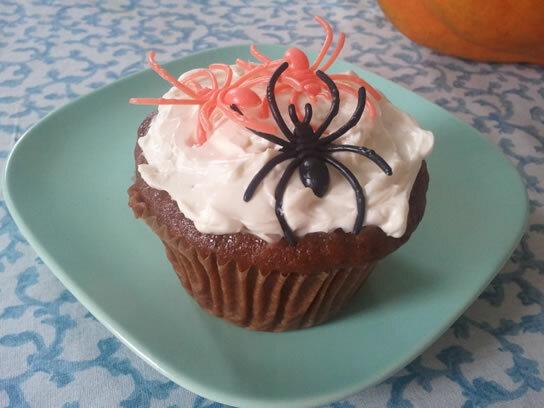 Spiders look good, like they’re crawling all over it the cupcakes.